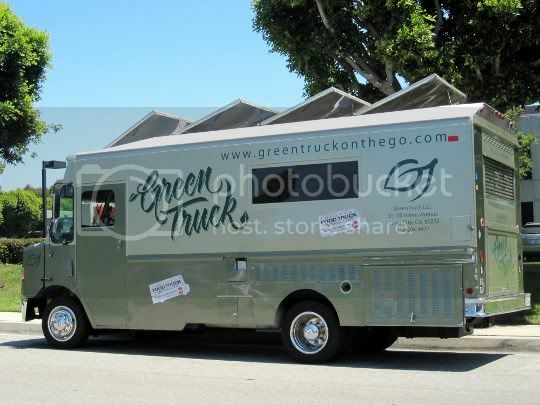 As you've probably seen if you're living in Los Angeles (or another major metropolitan city), pretty much everyone's hopping on the food trucks bandwagon...even the greenies! 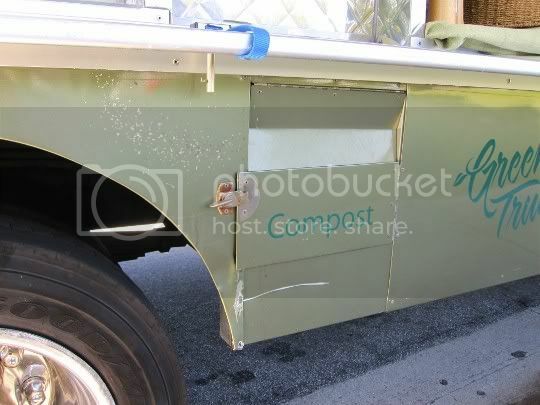 Behold the Green Truck, a 100% green and sustainable food truck serving up vegan and vegetarian meals (however, they do also serve meat). 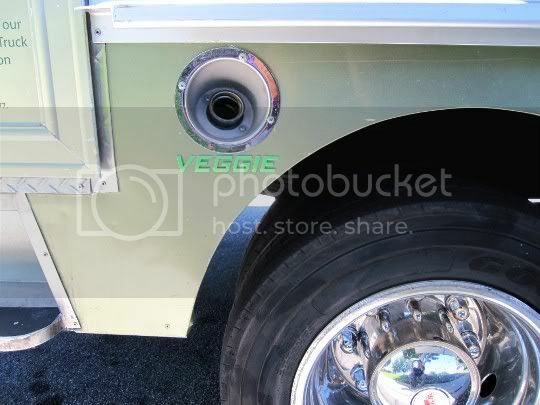 And what other food truck do you know that runs purely on vegetable oil, complete with compost and recycling bins? There are a few daily breakfast and lunch vegan and/or vegetarian menu options available, although the menu seems to change a bit depending on the day. But follow this truck, there's always something for us! 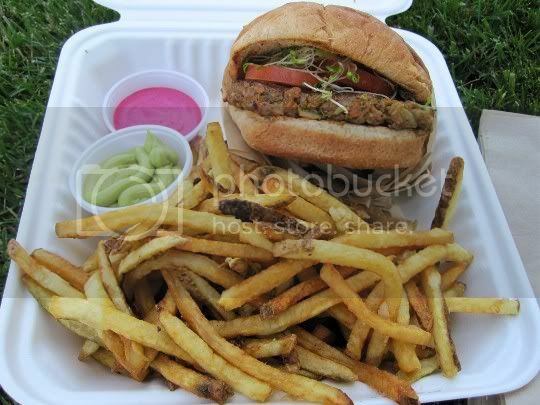 The truck's signature vegan burger, The Mother Trucker, is unlike anything you'd ever think you'd eat off of a truck. It tastes, well...REAL. Like anything you'd get at a restaurant (yeah, that price included...sheesh). But for good, fresh, healthy, flavorful food, I'd say it's worth it. 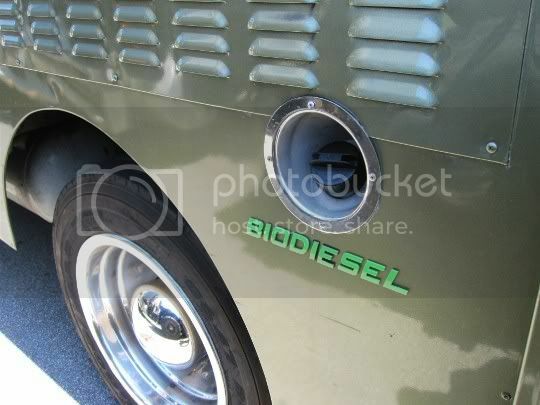 And how many other trucks are offering something like this? None! It was good and hearty (with such amazing flavor), and topped with sprouts, tomato, and the truck's signature beet sauce (more on that below). You can tell this is one of those burgers with just a ton of stuff and spices in it: your taste buds go into overload trying to decipher them all. I was able to detect some kind of beans, nuts, sweet-spicy coriander, and definitely the unmistakable bitterness of tahini. The only thing I wasn't too crazy about was the burger's texture: it was too soft, almost like a mashed up patty on a bun. In fact, I'm not even sure how long it was cooked (or if at all). There was no crispiness, not a lot of hold, and not a lot of signs pointing to a pan fry or oven bake. The fries were absolutely delicious because, well, they were real too. I have to praise these trucks out here that are serving up real French fries (like Frysmith) and not the obviously frozen and reheated ones. They weren't overly greasy, and were seasoned with rosemary and big clumps of fresh minced garlic (YUM!). There wasn't much other seasoning, like salt, but that was okay...I was in love with all that garlic anyway! 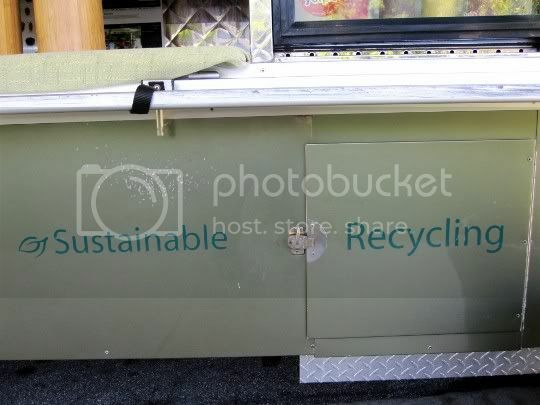 Perhaps one of the best surprises of the Green Truck is the homemade sauces, all available for free (and you'll want a lot of it), and all vegan! 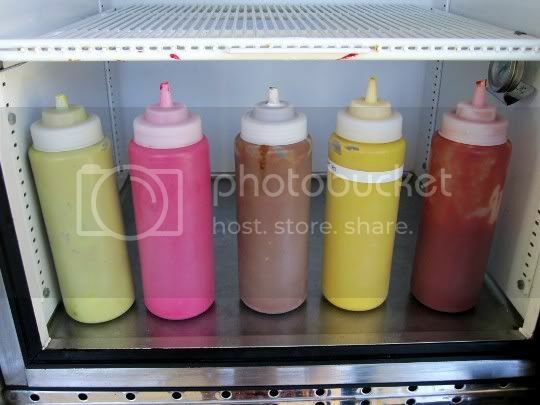 They are (from left to right) avocado mayo, beet sauce, pineapple salsa, and the standard mustard and ketchup. I tried the beet sauce last because (ew) I'm not crazy about beets, but this was by far the BEST one! Fruity, sweet, light, refreshing...strange descriptions for a burger condiment, but it really works (trust me!). I suppose the beets are only added for the rich magenta color, because you don't taste them at all in the sauce, so use liberally! The avocado mayo was thick and rich, with lots of guacamole-esque flavor. And the pineapple salsa...smoky, roasted, sweet, and spicy. This would be amazing served with chips, or with anything! Follow again? Definitely. The prices are a bit steep, in my opinion, but the amazing tasting food (and knowing that you're guaranteed a healthy, fresh meal) is worth it.